The CF-104 was designed for low altitude strikes carrying either conventional or nuclear weapons and spent thousands of hours skimming the surface of the 640 square mile Air Weapons Range at Primrose. The range provided hundreds of air strike configurations that allowed RCAF pilots to practice routines that might be expected in a full out war with the USSR, our arch enemy at the time. Low level flying with an advanced supersonic fighter jet that was highly unforgiving of pilot error, lead to many accidents that killed dozens of pilots and the German Air Force suffered the greatest losses in terms of number of pilots per thousand hours flown. While Canada lost many pilots, the rate of loss was much lower. In this dangerous mix of new aircraft in a low level training mode, our fire crews were trained to assist whenever and wherever possible. The 104 was a favourite with residents at the base and in the Cold Lake area who came to love the shrill, undulating banshee sound of the CF-104 as it taxied and during engine tests (check the video attached to this post). That shrill whistle could easily be heard for a 20 mile radius around the base. In the winter when temperatures dropped to -20 or -30 the sound seemed to actually slice the air as the afterburners kicked in on takeoff. 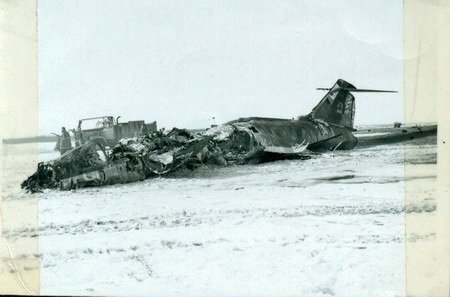 Photo: CF-104 crash in a field near Cold Lake courtesy of Don Teed an RCAF Fireman. This craft may be the burnt frame of one that crashed near my parents, Wilfred and Laura Skarsen, farm. In the Fire Station we were always alert to every take-off and, when time permitted, watched most departures and landings. Also, from 1965 onward, we always had a front line seat at my parents farm with was only five miles directly off the end of runway 310. 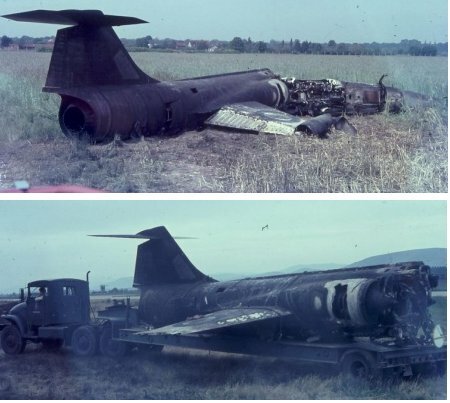 On one occasion a CF-104, which lost power on take off and the pilot safely ejected, crashed in an open field just a few hundred yards south-east of the house. My parents reported the house actually shook when the plane exploded on impact. On this particular day as we were enroute to the crash site, the chopper reported the fire was out and the pilot had not survived. Apparently he had successfully ejected at the last minute but there was insufficient time for his chute to slow his trajectory before plunging into the heavily forested area. As our services were not required at the scene as it was being turned over to the crash investigators and others who would recover the pilot. Crashes such as this were to be repeated many times at Cold Lake and other bases across Canada as well as in Europe. In a strange twist of fate the crash of this CF-104 would intersect my life some twenty-five years later in my role as a Detective Sergeant. That story, about a young woman caught up in a drug smuggling operation, will eventually appear in the Police Notebook Series. Although our crews attended every start-up, takeoff and tanker landing, we experienced only one KC-97 crash during our time in Cold Lake. 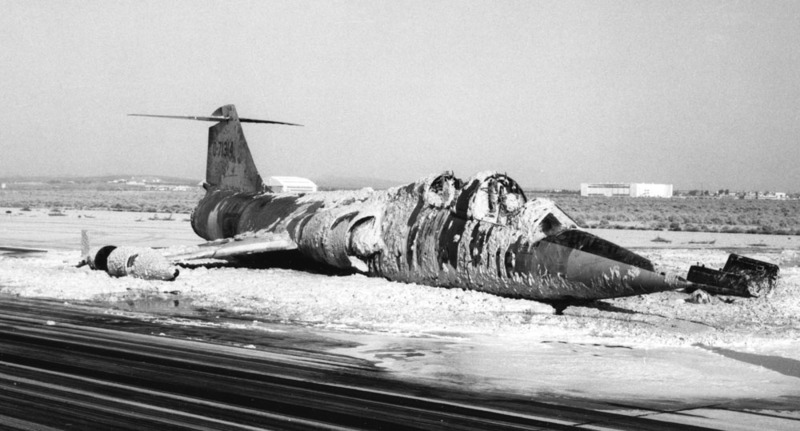 In the winter, heavy snow banks tended to pile up on the side of the runway and conditions on the surface of the runway itself were not always ideal. 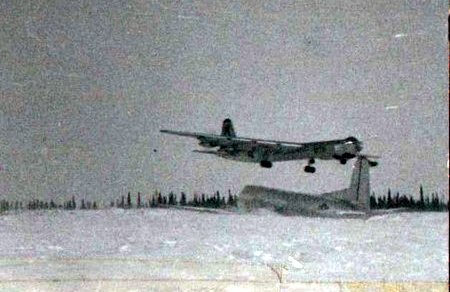 Photo: A B36 bomber heads toward touchdown over an aircraft that had run off the end of the runway and gear collapsed. Location unknown but the trees look like a northern Canada location. Raymond Birn’s crew was on standby one day as a KC-97 circled for an approach and landing. Everything was normal as the plane touched down but after a landing roll of only a few hundred feet it suddenly veered sharply to the left and careened off the runway. Moments after leaving the runway, contact with the piled snow caused the nose wheel collapse. As the nose dropped to the ground and plane came skidding to a halt, the pilot cut power to the engines and popped the emergency exit covers. As the escape ropes dropped and the crew scrambled out, the fire crews sped over and prepared to launch a full out foam attack if any fire appeared. Even with the nose on the ground the crew still had to drop 20 or 30 feet to reach the ground. Two crew members needed assistance as they had sprained ankles when they hit the ground. Although no fire was evident the crews doused the wings and engines with a blanket of foam in the event any of the huge fuel tanks had ruptured. A follow-up investigation revealed that shortly after landing the propellers were put into reverse pitch to assist in slowing the aircraft. Apparently the propellers on one side failed to reverse and this resulted in an immediate loss to directional control. Before the pilot could respond, the aircraft was headed off the runway. It was a close call but it would have been much worse if a fire had erupted. As with many modern, supersonic jet fighters, the CF-104 with its very sleek lines and razor thin, short wings required a high speed approach in order to avoid a stall. Although the main runway at Cold Lake was over 12,000 feet, that was not nearly enough in some instances. Two safety devices were used. First, the CF-104 was equipped with drag chute of the type many may have seen deployed on space craft returns. The 104 chute was usually deployed to reduce wear and tear on the brakes (see photo at the end of this Chapter of CF-104 drag chute deployed). The arrester cable on the other hand was placed near the end of the runway and was designed more for emergency use in case the drag chute was not sufficient to slow the aircraft. Among other duties at the base, we periodically attended to help reset the arrestor cables after it had been deployed or to replace nylon rope that had a short shelf life. The cable system was very similar to that used on an aircraft carriers and were installed on the main runway. Although the length of runway 310/130 significant, it was not nearly sufficient for a CF-104 attempting to abort a take-off or for one that came in hot and could not stop before running out of pavement. 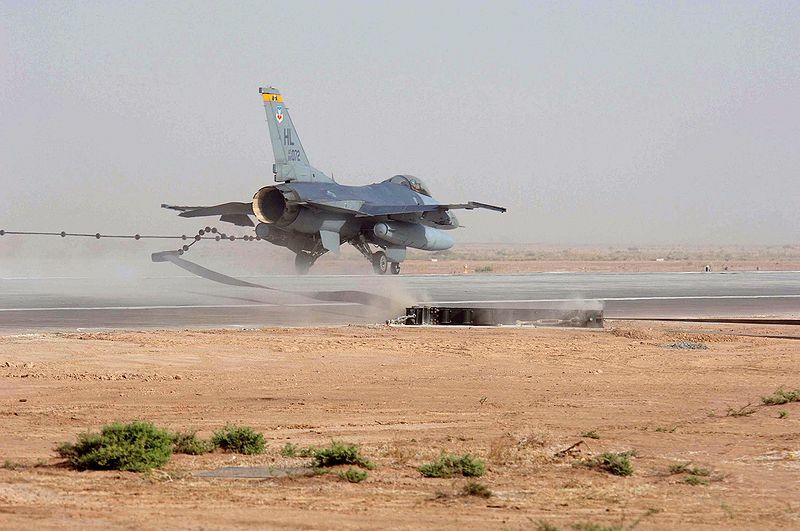 Photo: An F-16 engages a land based arrestor cable similar to the type used at Cold Lake. The arrestor cable was strung across the runway about 500 yards from the end and held about four inches off the pavement by small hard rubber disks. As the aircraft passed over an arrester hook near the tail of the aircraft would catch the cable and drag it to a stop. This was accomplished by attaching each end of the arrestor cable to a ¾” nylon rope that was channelled into an underground tube filled with an antifreeze type liquid. When the aircraft snagged the cable, a plunger attached to the end of the nylon rope would be pulled through the tube and as the tube narrowed it would slow the progress of the nylon and hence the catch cable and aircraft. After being deployed we would use the R Deuce to pull new nylon rope into the tube thereby resetting the system. As the nylon rope could only be used one or two times, the rest was thrown away. It seemed there was always 1000s of feet of used rope around the base and in town. 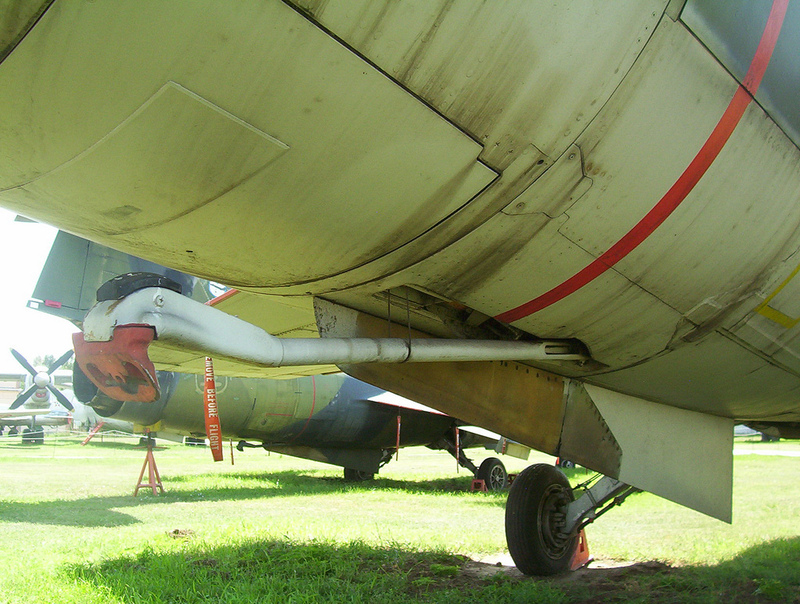 Photo: Tail hook on CF-104 partially extended. Our comrades at the RCAF Station Namao were the first to nearly write off one the Crash Trucks, an R-Deuce. On every base the R-Deuce was used to make various runs around the aerodrome providing assistance as needed and to check out reported problems that may need the presence of the fire department. On one run in Namao, the R Deuce crew was not made aware that a ditch had been dug across the grass area next to the taxi strip. There were speeding along and cutting across the grass area and at the last second noted the ditch, about two feet wide and three feet deep. With no chance to stop or turn, the truck hit the ditch straight on at about 40 or 50 miles per hour. The wheels were stripped clean off the bottom after which the body slid to a halt. No one was injured and the crew was not held at fault, however, they never did live down the jokes told about the accident at every SAC base across Canada. Photo: O11A in Fire Hall Bay at Cold Lake. Photo courtesy of Raymond Birn. One crew at Cold Lake suffered a similar embarrassing accident, this one with an O11-A. Each time we left the hall on an emergency call, the doors would be simultaneously opened by the fireman on duty in the alarm room. All four doors would slowly run up and back on the tracts as with most electric garage doors. As the doors rolled up the drivers would start their engine while the crews climbed aboard. By the time the doors cleared the roof of the truck they would be prepared to move. On this day, for some unknown reason, the door in one of the bays doors housing an O-11-A stopped just sort of full height. As the trucks moved forward in unison, the turrets from one O-11-A caught the door and brought it along with the truck. The door then collapsed on the top of the truck. The investigation revealed there was a fault in the door mechanism so the driver was not held at fault but, again, it was one of those highly embarrassing accidents that hung with the driver and crew for the rest of their time at Cold Lake. As the name implies, Cold Lake could be cold, very cold. This made little difference to the operations at the base unless a cold snap and blizzard took things below -45. Our fire trucks were capable of working in ambient temperatures of +140F to -60F so weather did not stop us from performing our duties. An item that was more of an irritant was parking for our vehicles, particularly during severe cold snaps. We had to park in an open area just outside the main gate to the SAC base and walk about a half mile to the fire hall. The walk was no problem but leaving our cars for ten to fourteen hours in the open without any heat, meant a dead battery at the end of shift. 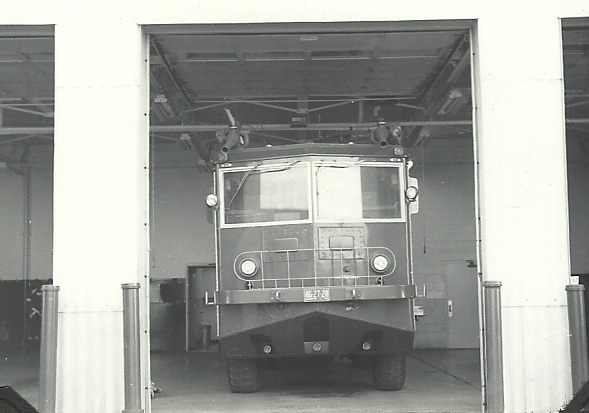 The only alternative we had was to remove the batteries from our cars, lug it to the fire hall and then after shift, lug it back and cross our fingers battery would have sufficient kick start an engine that, even with 5 weight oil, would barely turn over. If the engine did not start on the second or third try, we were stuck and would have to pile in with anyone whose car had started. Over our time at the base, the problem was never solved. Another challenge that caused a few injuries was the double bunks in sleeping area. Most of the crews, except for the alarm room operator, would retire by midnight. On the rare occasion when the klaxon horn sounded between midnight and six in the morning, the crews would scramble. If anyone on a top bunk forgot they were on a top bunk when they bailed out, they were in for a terrible crash to the floor some five or six feet below. After two members were sent off with ankle injuries, the sleeping area was expanded to accommodate only single bunks. this is a very interesting site.As i was stationed at Namao in the sixties,and have been to Cold Lake many times.Was stationed at penhold in 1960.Enjoyed. Thanks for making contact John and appreciate your email. I have passed along to my wife, Lynn. I work for the Federal Aviation Administration (FAA), and I am sending this e-mail to request permission to use some of your photographs such as the crashed F-104, in one of our safety publications. There will be no financial gain and we will credit the use of the photo to you. Please let us know.